I’m told by the Portland International Auto Show organizers, that no fewer than 100,000 Oregonian's will walk the floor of the Oregon Convention Center for the regions one and only major Auto Show. In Portland, attendees have the rare opportunity to view and experience 600 current model domestic and import cars and light trucks. Wear your running shoes. The Portland International Auto Show covers nearly 500,000 square feet. To put the floor size into perspective, visualize 10 average supermarkets, or 2.5 Costco Wharehouse Stores, it’s big man! Torque News toured the convention floor on set-up day. It’s quite the spectacle, as dozens of personnel work to meet the pending timeline of Press Day and the coming weekend. For 2018, America’s major auto brands are in the house, with special displays by Jeep Rubicon, and the redesigned from the pavement up Dodge Ram 1500 Series pickup truck. Impressive. Sooting from the hip, Fiat Chrysler gambles on the future of mild hybrid technology. e-Torque can now be optioned for Jeep Rubicon, or the redesigned Ram pickup, gasoline or small displacement Diesel engine powered. I'll drive one on my next trip to Las Vegas. Yet one would be hardpressed to miss the armada that is Honda Motors -- impressive to say the least, with a surprise or two in the lineup. For those of you who have not experienced a close encounter with 2018 Civic Type-R, here’s your chance to sit in Type-R’s radically high bolstered seat, look under the hood, and kick a low profile racing tire or two. Yet something that’s just as impressive in its own right is Fit Sport, a car that I’ve spent some seat time in, but haven't caught on the street-yet. There’s something very accessible about Portland’s Auto Show. Although large by regional show standards, there’s an advantage to attending a one-building Auto Show. In Portland, you’ll discover a very logical, easily accessed domestic, or import car and light truck grouping. This allows ease of auto brand comparisons, without leaving the building. Honda, Hyundai, Kia, Nissan, Toyota, are all in close proximity to each other for ease of model comparison. While in Portland, take a comprehensive look at Honda’s award-winning pickup truck alternative, Ridgeline, or Pilot SUV, for off-road capable, family-hauling utility and comfort. Then, for 2-row crossover fans, I recommend comparing 2018 Honda CR-V to Toyota RAV4, the Adventure Edition earns a hard look. 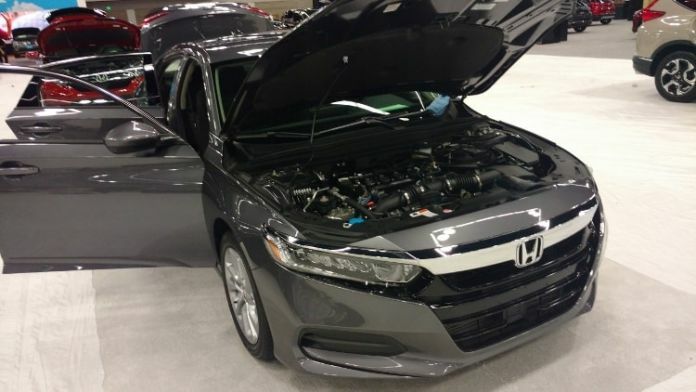 And then, for Accord fans, there it sits in its redesigned Car of the Year Glory, the all-new 2018 Honda Accord. Embarrassingly, I didn’t recognize it at first. The Accord remake is truly stunning. With that said: While not a grand as the Las Vegas SEMA Show, I recommend the Portland International Auto Show to anyone pondering the purchase of a new car or light truck. It’s also an affordable family outing. Truthfully, I was exhausted after 4-hours of taking in the visual that’s Portland’s largest automotive event Find more information on the Portland Show here.